Our whales come with a money-back guarantee! 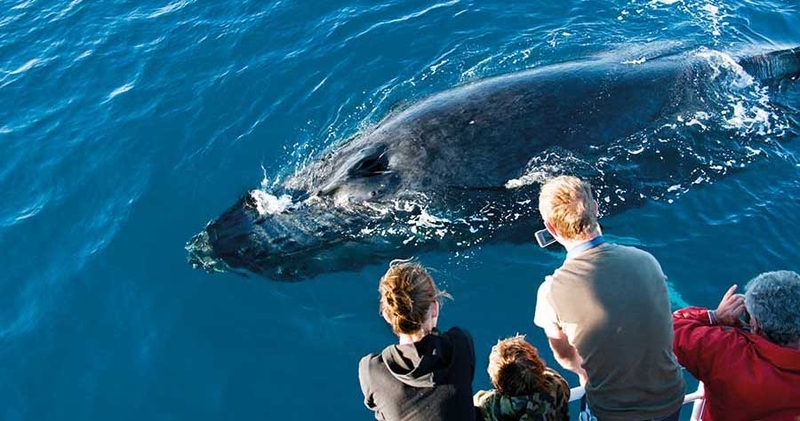 Whale watching is becoming one of the world's great natural experiences, and nowhere is it as enthralling as in the calm waters of Hervey Bay, Queensland. This rapid growing coastal city has become known as the Whale Watching Capital of the World, an accolade bestowed by experts and the many thousands of visitors who are overwhelmed year after year by the acrobatic displays by the humpback whales - the most surface active of all the great whales. Every year thousands of humpback whales travel from Antarctica along the east coast of Australia to give birth in the warm waters of Northern Queensland. On their return migration they stop to rest and play and nurture their calves in the safe waters of Hervey Bay in the protected lee of Fraser Island. It is an amazing experience to watch, from very close quarters - sometimes no further away than arm's length - 40,000kg whales leap out of the out of the ocean, lift their great heads to watch the whale watchers watching them, salute with their flippers, splash their powerful tails as they take a dive and roll over like puppies. Finally there is the added bonus of the World Heritage Listed Fraser Island on the doorstep so whale watchers can combine the best nature has to offer with a visit to the island, all in the one holiday.